I posted this tutorial in January 2013 and it has received many visits and comments. I revisited my original post yesterday with the intention of editing it. I accidentally deleted it instead! Luckily, I had saved a copy of the text and photos on my computer. So here it is again....an updated and improved version rewritten to address some of the queries that I received. This is a long and detailed tutorial. Reading it takes longer than actually knitting the v section of the neckline. After the first round, you will find the instructions very easy to follow. Stop press: I am editing this again to include a different way to knit the second decrease. It took a different pair of eyes to see a better, safer and easier way. Thank you, Ian Young! I spent many hours knitting an Aran jumper for my daughter. She chose the pattern and I wanted to do it justice. However, it had been translated into English from another language and had lost some detail along the way. I knitted the front and back of the jumper and followed the instructions to sew them together at the shoulders. The pattern then called for knitting the edging to the v neck "in the round" on one circular needle. This is where my problems began because the pattern was very vague about exactly how to do this. In short, I had to rip out 2 botched attempts and go for lots of calming walks. I then performed an Internet search and found many different methods of knitting a v neck "in the round". I cast some stitches onto a very short circular needle and tried some of them but none looked good with Aran wool which shows up every stitch very clearly. Eventually I went back to my original pattern and pored over it until I understood what to do. This took far longer than I was happy with. So, in case I ever knit another v neck jumper, I just want to record the detailed instructions here. If anyone else finds them useful, that will be a bonus. I was knitting with Aran wool. I had already sewn the back and front of the jumper together. My v neck edging was in single rib and I decreased 2 stitches on every row. By following these steps, I ended up with a neckline that looked good. 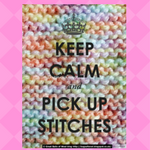 pick up the required number of stitches with a circular needle. The shaping looks better if you pick up an odd number of stitches and make sure one stitch is in the bottom centre of the v. For neatness, commence picking up at one of the shoulders. 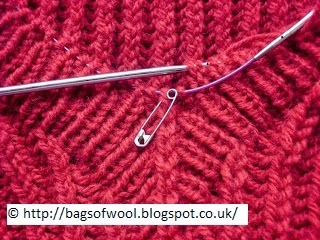 mark the centre stitch with a safety pin or other marker. This is especially important on the first few rounds. rib until one stitch before the centre stitch. 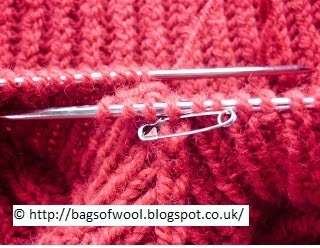 slip the centre stitch onto a cable needle and keep it to the front of your work. slip the last stitch from the right hand needle back onto the left hand needle purlwise. 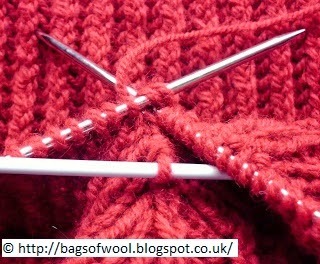 ·knit together the first two stitches on the left hand needle. This is the first decrease. you now have to knit the second decrease. These were my original instructions. You can either follow these or move down the page now to the "Ian Young" method which I can recommend as safer and easier. slip the stitch from the cable needle onto the right hand needle purlwise. 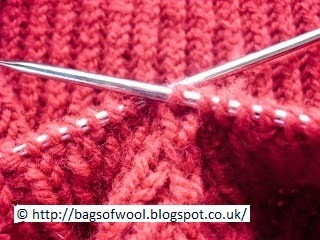 carefully pull the slipped stitch over the last worked stitch on the right hand needle. This is very fiddly as it involves removing the last worked stitch from the needle. But it is essential as it is the second decrease and gives the nice raised line of stitches up the centre of the v shaping. If you are happy using a crochet hook, you could insert it from left to right through the slipped stitch and use it to grab the last worked stitch. This would stop the stitch from dropping and disappearing. 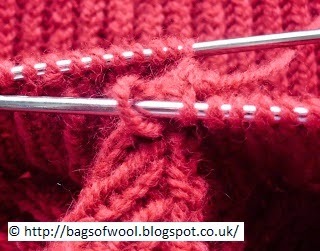 Otherwise, carefully pinch the last worked stitch between finger and thumb when it is off the needle. put the safety pin back into the new centre stitch. This is optional after the first few rows. But I find it a useful reminder of where the centre stitch is. 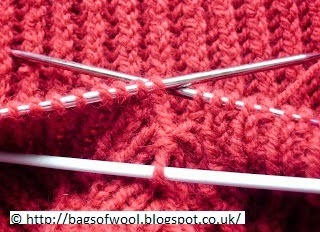 The "Ian Young" method is to slip the stitch from the cable needle onto the left needle. Then slip the last stitch from the right needle onto the left needle. Carefully pull the stitch that was on the cable needle over this last stitch. This is now your new centre stitch. So, insert the safety pin into it and carry on ribbing. I have tested this easier method and it works in the same way as my original method but is much safer and quicker. It is the method I will choose to follow the next time I knit this pattern. complete the number of rounds as specified in your pattern. cast off. The decreasing process described above is also done on this cast off row. ·I like to cast off ribwise. But it is also possible to knit all the cast off stitches for a tighter finish. 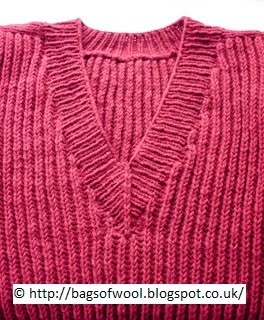 You have now completed your v neckline and should have a neat finish similar to my first photo above. Boring but necessary: this tutorial is all my own work. 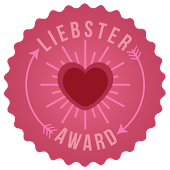 I am happy for you to refer to it and even to publish links to it. But please don't reproduce the text or photos on any other website or blog without my permission. Many thanks. That's awesome.... I'm so tempted to start knitting!! Thanx, I'll have to try this! Hi Una, I just wanted to thank you for the v neck in the round tutorial. I have used it to great effect to do the neck of a fair use sweater in aran weight. Although I thought it was going to be hard, it's was easy, and looks perfect! I used the Ian Young for second decrease. Thanks again for sharing.